During my year abroad in Korea, Dave came to visit. There was a group of us that went to Taiwan (worst vacation I've ever had...) and then Dave and I only had 1-2 days in Korea because there was a typhoon in Taiwan that delayed us. I had so much I wanted for Dave to see but not enough time in the world to do it. 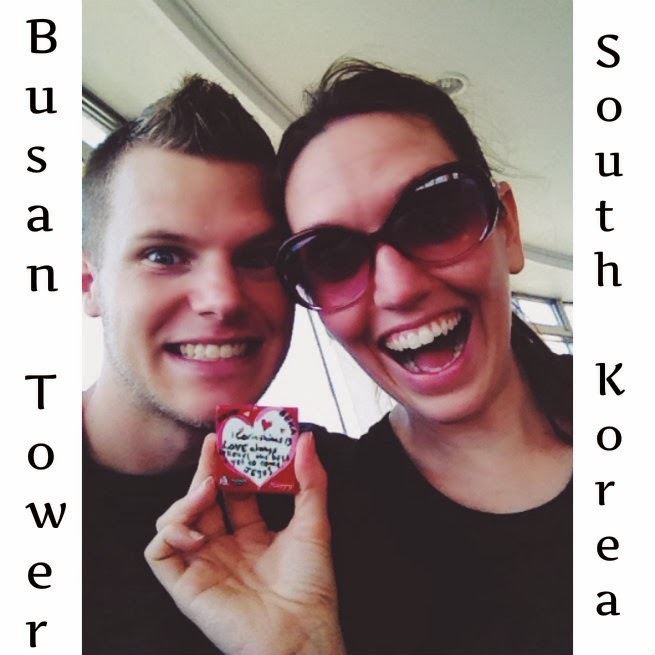 Before I took him to the airport we thought we would make a quick stop at the Busan tower. If you are in Korea I highly recommend visiting. The sights at the top of the tower were beautiful. I loved seeing the 360 view of the city. 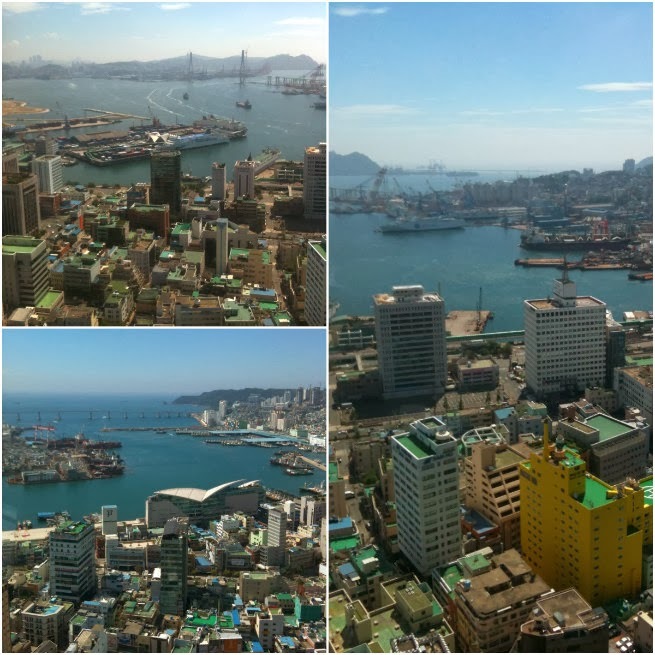 Busan Tower not only offers breathtaking views of but they also offer various cultural things at the bottom of the tower as well. Next door hey had a museum of musical instruments and they even let you play a lot of them. But what really got me excited to the zillionth level was these little tile hearts they had. 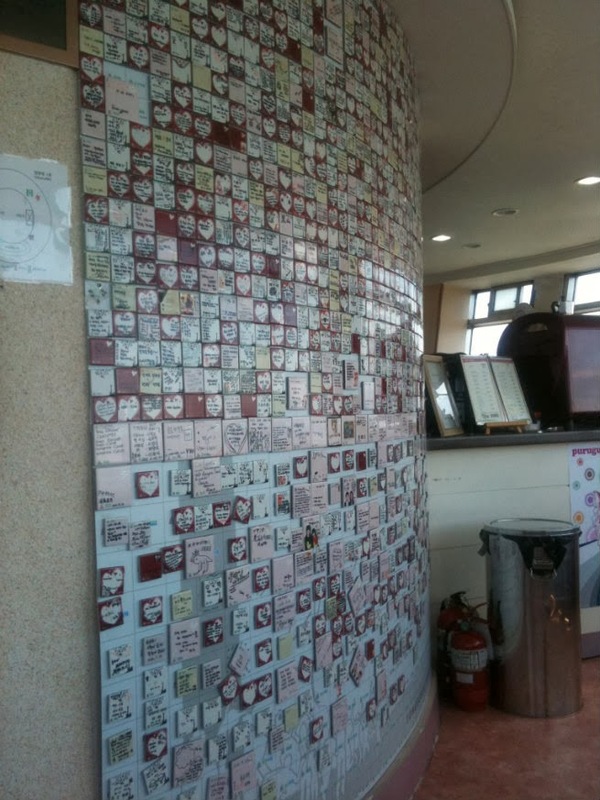 You could purchase a heart tile, write a message on it and then glue it to the wall at the top of the tower. I was all about this! Dave, although it was cheesy, joined in. How could we not though? 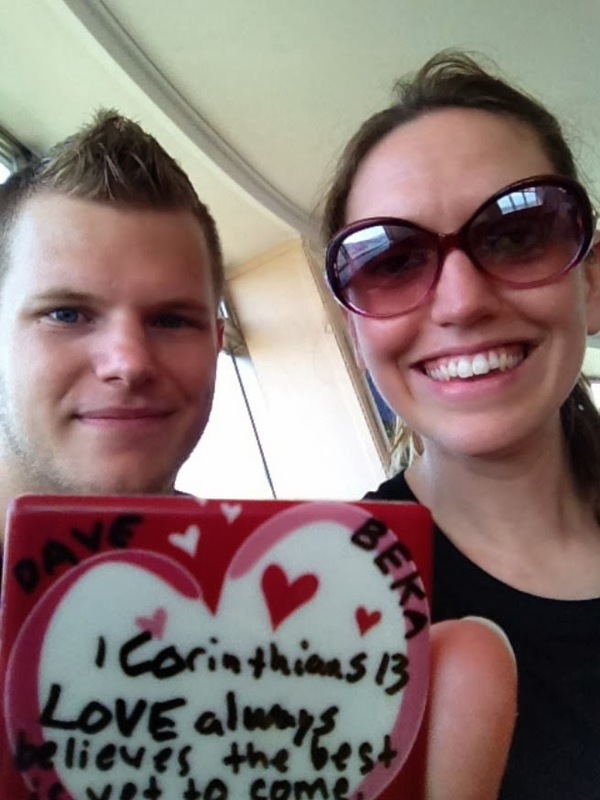 I mean, our little love tile will be there forever. 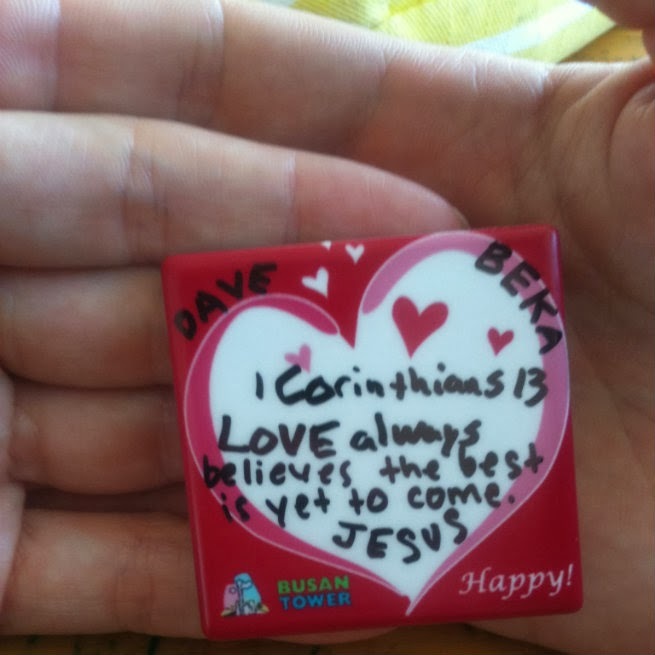 Somewhere in our dating relationship Dave told me the saying "Love always believes the best is yet to come". We now say "With Jesus our best is yet to come". It's a saying that has stayed in our marriage and I really believe it's true. It's also a good reminder for reasons I could go on and on about. 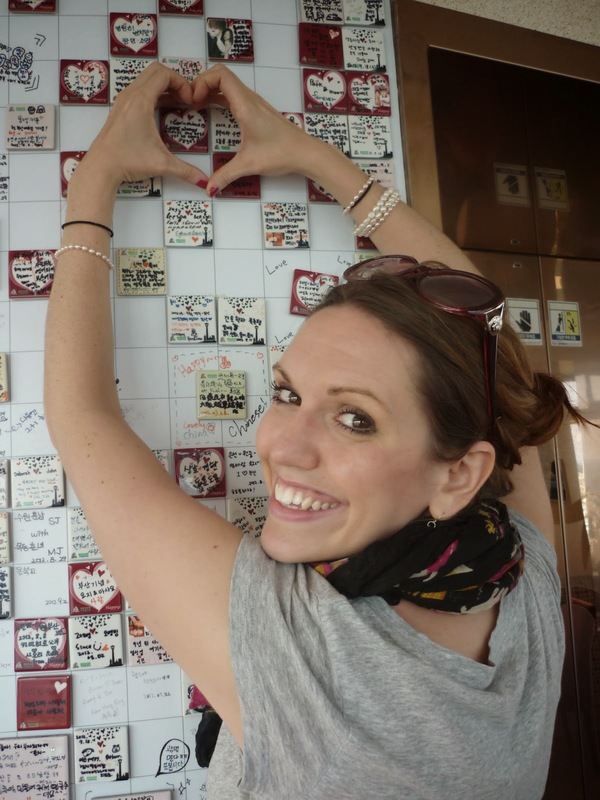 This picture pretty much sums up each of our feelings for the love tile. What's the cheesiest love thing you have ever done? Would you do something like this? Linking up today with Bonnie Rose, Melanie and Tina for Travel Tuesday. Oh the love tiles are SO sweet! I love what you chose to put on it! And what a view!! 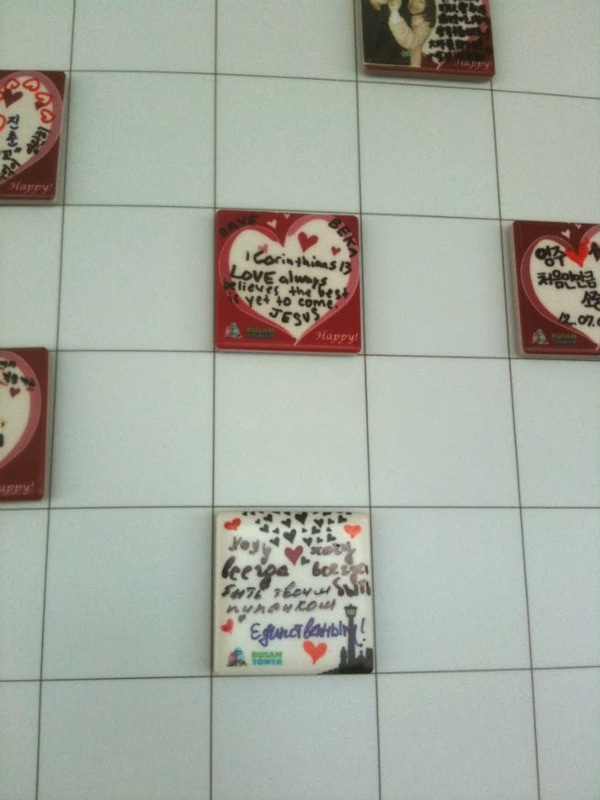 Love the love tiles so sweet! Loved looking around your blog! I also have a heart for missions work. I look forward to watching your upcoming journey! i love doing cheesy stuff like this too! :) that is so neat!!! one day you both should go back & find it! That would be so fun to go back and find it! Hopefully they leave them up forever. I don't know many men who consider this 'romantic' (except for the Asian men). I just googled it and they have places in America with the locks. When you go back you definitely should visit. 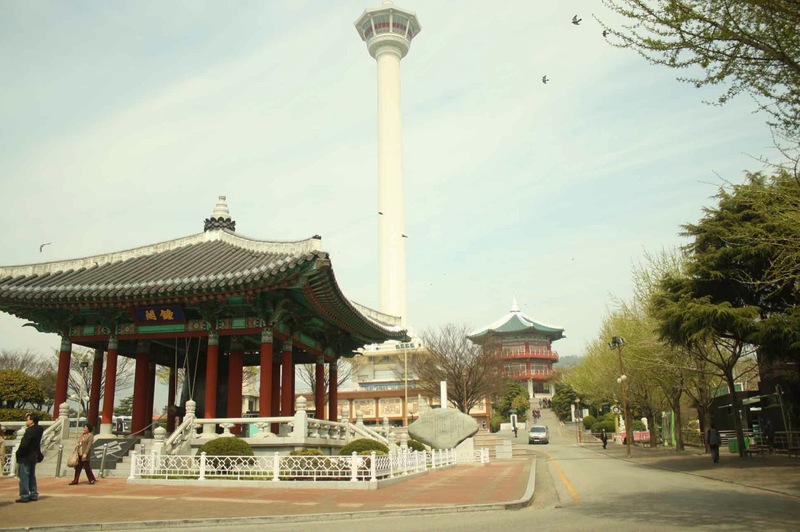 Where all did you visit in Korea? That is a big whirlwind trip but I'm sure it was awesome. I never made it to Jeju-Do but I did visit those other places. They were pretty. I've really been wanting to do this for a while and still haven't gotten around to it. My boyfriend and I met in Korea so it's definitely a must do before we leave Korea.